The Ports of Auckland Round the Bays is an 8.4km flat course from the Auckland CBD to St Heliers Bay.The start is located at Quay Street and the course continues along Auckland’s Waitemata harbour to a spectacular finish at St Heliers Bay. Leave your headphones at home because we’re bringing you music and entertainment every step of the way, from the start line right through to the finish. There will also be plenty of water stations on course to keep hydrated, as well as toilet stops. 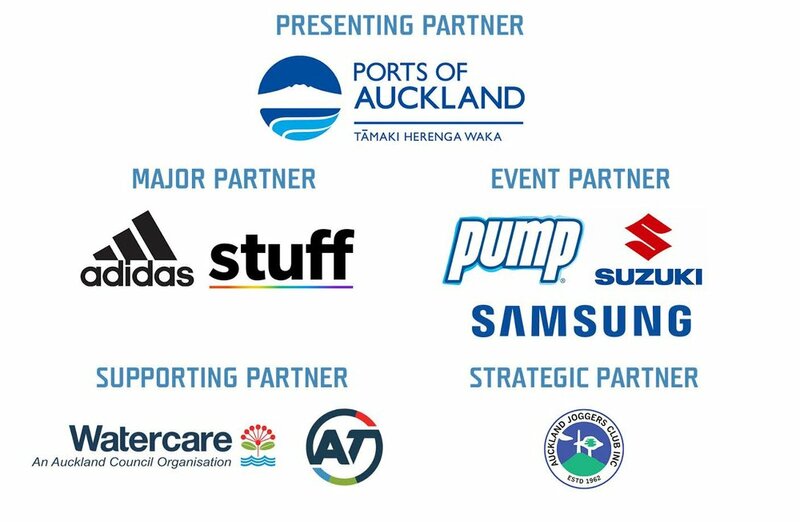 As the event organiser of the Ports of Auckland Round the Bays, Stuff takes the safety of our participants as paramount importance. We have strict requirements around the management of Health & Safety across the course and only allow drone operators who have our consent to fly drones in the area of the course. In the interests of safety we request that drone operators who have not obtained our consent, refrain from flying over the course. Any drones operating without our consent in breach of part 101 or part 102 of the CAA rules, will be photographed along with their operators and will be reported to civil aviation authorities. Are bikes allowed on the race? No pets, bicycles, scooters, handcycles, skateboards or rollerblades are permitted in any group. Entries will open on the 16th of October. Payment can be made using a credit or debit card. If you do not have a credit or debit card, New Zealand Post provides a prepaid card service. Please take care with your entry as we cannot change your start group after your registration is completed. Find step-by-step instructions on how to create an entry here. Anyone of any age and ability can enter. Please assign yourself to the appropriate start group based on your running or walking speed. No pets, bicycles, scooters, hand cycles, skateboards or rollerblades are permitted. Those with strollers or non-racing wheelchairs are requested to start in the walkers purple group for safety reasons. Can I enter more than one person at a time? Team managers have the option to create their team, register themselves as a participant (if applicable), then complete the entry form. Once completed, team managers can invite others to join via Members Hub. Those invited will then be prompted to enter their own registration details. If however you wish to create a team and want to fill in all individual entries yourself, once you’ve completed your own registration details, at the end of the entry form you can select “add another entry”. Add as many people as you wish, making sure that all entry details are correct (we recommend no more than 10 per transaction) before proceeding to the checkout.Please make sure that you carefully check the summary page before making your payment as no refunds can be given for change of mind. Please note that the receipt for all entries will go to the first person entered. Each individual will receive their own eTicket, sent to the email address entered on their individual form. I am having trouble viewing and completing my registration. Please be advised that Internet Explorer 8 and 9 are not supported by our system and you will experience difficulties in your online registration if using these browsers. You can upgrade your Internet Explorer to IE11 for free. Alternatively, please use Google Chrome, Mozilla Firefox or Safari. All online entries can also be completed using a smartphone or tablet. Can I transfer or refund my entry fee? Please take care when entering as entries are non-transferable to another event, distance, start group or person. Refunds are available in accordance with clause 23 and 25 in the terms and conditions. 23. I acknowledge that refunds will only be made prior to 5pm Friday 1 February 2019 and will only be given where participation in the Event is not appropriate due to a relevant medical reason that is supported by a current medical certificate outlining the condition. I understand that a 50% administration fee will be deducted and if a race bib has been sent out, I must return the race bib to Stuff at my own expense, prior to the processing of a refund and by no later than 5pm Friday 1 February 2019. 25. I acknowledge that I will not be entitled to any refund if the Event is cancelled by Stuff for any reason. View full terms and conditions. How do I get my race bib and timing tag? If you enter before Friday 14 December, this will be posted to you. If you register any time after 14 December, you will need to collect your bib and timing tag. Bib Collection (if you entered after 14 December): Victory Convention Centre, located on Beaumont Street, Freemans Bay. Friday 1 March: 10.00am - 7.00pm; Saturday 2 March: 9.00am - 5.00pm. Parking: There is car parking available at the Victory Convention Centre. How do I get my gear from the start to finish line? There will be a gear drop truck at the start line situated on the corner of Quay and Tangihua Street it will be open form 7.00 - 9.00am. Drop your gear there and we will drop it at the end. Pick up from the Finish Line on The Parade side of Vellenoweth Green. If you are catching a bus to the start line you can also drop excess clothing at Vellenoweth Green before you board the bus. What options are available for transport between start and finish line? Please note there are no event buses departing from Madills Farm or Glover Park - all shuttle services to the city after the event depart from Long Drive. Am I allowed to run with an iPod or other music devices? We encourage you to leave your headphones at home because we’re bringing you music and entertainment every step of the way, from the start line right through to the finish. The use of iPods and other music players while competing have inherent risks and as such Stuff discourages their use by participants. You also need to hear safety messages. What do I do if I need first aid or don’t feel well during the race? Please don’t compete if you have been sick or have had a viral infection in the two weeks prior to race day. You may potentially be putting your own health, and the health of fellow runners, at risk if you do so. We will have St John first aid stations located along the course to help you if you are feeling unwell. If further assistance is required, such as transportation to hospital, costs are incurred by the patient. What do I do when I finish? Celebrate, you did it! But more seriously, once you have crossed the finish line, please keep moving towards the drink stations and move as far as you can into the recovery area before stopping. Please don’t wait for friends and family just past the finish line as this creates congestion for runners finishing after you. We suggest arranging to meet your friends and family at the designated meeting places. We have flags the same colour as your bib that may be useful to meet at. We’ll have plenty of great music at the finish as well as food vendors to delight your taste buds! What happens if I have lost my race bib or timing tag? If you have lost or damaged your bib or timing tag tag you can buy a replacement from the start line bib collection for $10. Bring your eTicket with you and cash or eftpos card. Please note that there are only a very limited number of replacements for each start group. Can I collect race bibs for my team members? Yes, you can collect bibs and time tags for your team members. Simply bring a copy of their eTickets to bib collection. Please collate the eTickets in number order to make it easier for the Round the Bays team to find them for you. Remember to let your team members know that you are collecting their bibs so they do not try and collect the same bib. Information on how to collect your team’s race bibs will be available shortly. Do I have to return anything after the event? No, all race bibs and bib tags are disposable. Please use the waste and recycling stations provided where appropriate, and help keep Auckland beautiful. Please ensure you wear your race number on the front of your shirt with no clothing covering it for the duration of the event. Only seeded runners are allowed to warm up in front of the start line. Starting before your allocated gun time will cause congestion in the start group i.e. starting with runners when you're a jogger. Please start in your allocated start group. Please no pushing to get over the line, the bib tags ensure that you record an accurate start time based on when you cross the line. Please listen to the announcers for important last minute instructions. We ask all participants to be mindful of others and do not use iPods or other music devices during the event. Please keep left unless overtaking. Watch your footing for ramps, curbs and potential hazards. Please read our safety information to ensure you keep safe on the day. Injuries: Should you injure yourself or witness an incident whilst on-site or participating in the event, please report this as soon as possible to event organisers at Race HQ or phone the event hotline 0800 123225. Lost Children: If a child has become lost please report the missing child's details to event organisers at Race HQ (start line) or the Lost Children's Tent (finish and Hospitality Sites) immediately or phone the event hotline on 0800 123225, where appropriate action will be taken to ascertain the child's whereabouts. What are the event terms and conditions? View the Ports of Auckland Round the Bays terms and conditions here.